Struggling Finnish mobile giant Nokia unveiled Thursday a $99-touchscreen smartphone as it battles to gain traction in India and other emerging markets to reverse falling sales. 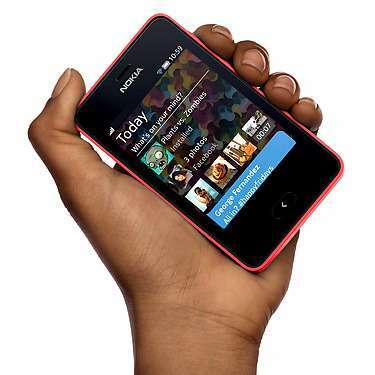 Nokia chief executive Stephen Elop released the Asha 501 in New Delhi, targeting users moving up from no-frills handsets, and said he believed the model would "reinvent the affordable smartphone" line. Elop told reporters that analysts estimate the lower-cost Internet-enabled smartphone category could be a $40-billion market globally by 2015. Analysts suggest the once-dominant phonemaker's future may lie in selling budget smartphones in fast-growing emerging markets such as India, Africa and parts of Latin America where customer penetration is still relatively low. "Global players are looking at price points below $100 where there are serious volumes to be had," independent New Delhi telecom consultant Kunal Bajaj told AFP. The Asha 501—Asha means "hope" in Hindi—borrows some of its looks from Nokia's higher specification Windows-based Lumia and offers an array of social networking content. It will start shipping to vendors in June and be available in 90 countries. "There is a huge opportunity in the sub-$100 range in India and other emerging markets—that price is definitely the sweet spot for users," Anshul Gupta, analyst at global consultancy Gartner, told AFP. Just 10 percent of the phones sold in India last year were smartphones but the segment is expected to grow by 45 to 50 percent this year, said Gupta. Gartner's Gupta called the phone, which claims 17 hours' talk time—vital in a country such as India with chronic power shortages—"a leapfrog experience" and said it raised the bar for what was available at under $100. 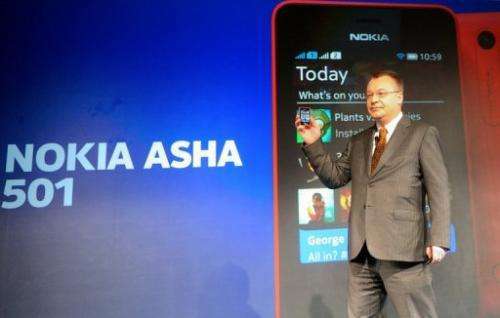 Chief Executive Officer (CEO) of Nokia Corporation Stephen Elop holds a Nokia Asha 501 mobile phone as he addresses an unveiling ceremony in New Delhi on May 9, 2013. Struggling Finnish handset giant Nokia unveiled its next-generation of lower-end mobile smartphones as it seeks to gain traction in a market expected to be worth $15 billion by 2015. Elop, fresh from a bruising meeting in Helsinki earlier in the week with shareholders unhappy over Nokia's earnings losses, said India is a "bellwether" for and a leading indicator of "new consumer requirements". "People in India are gravitating to better-looking, more feature-rich phones," said analyst Bajaj. Elop, who took the reins of Nokia three years ago, did not comment directly on the firm's finances. Nokia trimmed first-quarter losses to 272 million euros ($355 million) from 928 million euros a year ago but sales fell 20 percent. In India, the second-largest mobile market after China, Nokia faces a stark challenge with its smartphone market share diving to 13.3 percent in 2012 from 38.4 percent the previous year, according to Telecom Lead Asia. Competition is cut-throat from Samsung and Apple as well as from Chinese, Taiwanese and Indian handset-makers. The device will initially be a 2G phone "as 80 percent of the world operates in a 2G environment and 2G has the largest footprint in emerging markets," said Elop, but the range will expand to include 3G phones.